I will be transplanting daffodils this weekend along with setting out two rhubarb plants. I will first find a sunny location where they can grow over the coming years without crowding each other or competing for space with other plants as they grow quite large. I chose Victoria – not because it happens to be my name, but because it is one of the best varieties, or as William Woys Weaver put it, “the variety has established the gold standard by which to judge good rhubarb: large, fat stems, bright red skin, lack of stringiness, and a tart, apple-gooseberry flavor…”. It is a true heirloom, dating from 1837, the year of Queen Victoria’s accession, and it was named in her honor. Initially rhubarb was considered a medicinal plant, but by the early 19th century it was recommended as a market crop and could not be, “too highly recommended as a very salubrious vegetable for the family, either stewed or in tarts and pies”. “Family Kitchen Gardener”. 1847. NY. Mary Eaton’s book  contained receipts for Rhubarb tart, sherbet, soup, pie, pudding and sauce indicative of the many ways the English prepared it. The “Magazine of Horticulture & Botany, 1837, noted rhubarb growing in the vicinity of Newark, N.J., New York, Hartford, and Boston in July 1837, too early for Victoria to be grown in America, but almost certainly older varieties were being grown for culinary purposes. Joseph Myatt’s Victoria was described as, “…a red variety, of great excellence and richly flavored, grows very strong, equal to the Giant, and much earlier than that variety; is richly deserving of extensive culture”. – Buist, Robert. “Family Kitchen Gardener”. 1847. NY. Joseph Myatt was exhibiting specimens of his Victoria Rhubarb by 1839 in England, just two years after its introduction, as reported in the “London and Paris Observer”, April 28, 1839. Joseph Myatt was born in Maer, Staffordshire, in 1770, and moved to Deptford, England around 1880 where he began growing strawberries, quite successfully. He presented his “British Queen” strawberries to Queen Victoria, and was in turn presented a silver medal by Prince Albert, probably in the 1840’s. He began offering rhubarb for sale in markets about 1809, but it did not become fully appreciated until sugar became inexpensive enough for common families to purchase it and the introduction of his Victoria, a much improved variety. Myatt died in 1855 and is buried in Nunhead Cemetery, remembered as having done more to promote the culinary use of rhubarb than any other person. In fact, in 1851, “The Plough, the Loom, and the Anvil” said of Myatt (then over 70 years of age), he was a kind and most benevolent man. “It is now nearly forty years since he sent his two sons to the borough market with five bunches, of which they could only sell three, so little was the value of this excellent vegetable then known. The other two bunches they brought home with them. The next time they went to market they took ten bunches with them, all of which were sold.” – Published 1851. Philadelphia. The article, which was widely re-circulated, went on to say Myatt immediately set about increasing his stock, predicting it would become increasingly more popular as word spread, confident enough to ignore remarks from his neighbors to the contrary. “When one of his sons said in market one day that his father intended to plant an acre next year, they said, “Your father, poor man, is fast taking leave of his senses”. While Victoria Rhubarb’s earliest glory days stem from the environs of London, Americans were growing Victoria rhubarb by 1840 when the “Genesee Farmer”, reported it a relatively new variety. By searching early notices we can see at least a few of the states where it was grown during the early 19th century. Henry Ward Beecher wrote that he had obtained from New York seeds for Victoria rhubarb in 1842. He was living in Indiana at that time as he did not become minister of the Plymouth Church in Brooklyn until 1847. He advised much greater success in transplanting roots than with growing from seed. – Plain and Pleasant Talk About Fruits, Flowers and Farming. 1859. NY. In 1843, Mr. S. A. Halsey submitted a dozen stems weighing 16 ½ lbs. at the New York Farmer’s Club. Shortly thereafter, The Michigan Farmer and Western Horticulturalist included Victoria rhubarb in a list of seeds sent to them by the Patent office in Washington [March 1845]. The Cincinnati Horticultural Society noted Mr. J. T. Plummer of Richmond, Indiana had reported on his success with it and a committee was formed to evaluate the potential of growing it commercially. On the same page, it was noted that Amos D. Worthington had exhibited seven stalks of Victoria in Ohio. – The Western Farmer and Gardener. Aug. 1848. Growing Victoria rhubarb was not limited to northern gardens. William White of Georgia, wrote of successfully growing it after having received Myatt’s Victoria roots from Mr. Buist. – Gardening For The South. 1856. Athens, GA.
Advertisements are found in newspapers throughout the 1850’s and 1860’s, and in 1861, Charles Downing wrote from Rochester, NY, for the Gardener’s Monthly and Horticultural Advertiser, Vol. 3. 1861, saying some 15 years prior  he had attempted to purchase from an old friend in England a supply of Victoria rhubarb but instead received a letter stating that it, “could not be packed to send to America under a great expense of glass cases and personal attention on the voyage”. Glass cases were in essence terrariums used to keep live plants fresh and viable during sea voyages when they otherwise might have wilted and died. I won’t make any effort to harvest stems from my plants the first year, but by year number two, I should be able to follow Mary Eaton’s example and prepare a variety of dishes made from my own Victoria rhubarb. North West Kent Family History Society. Vol. 5, No. 3. Sept., 1989. Editor: Mrs. M. Alderman, 16 Crescent Rd., Sidcup, Kent. DA15 7HN. There are pears on my tree roughly the size of a thumbnail, perfect in shape and color, but very small at the present time. I don’t know what kind they are but from the looks of the tree it has been there for quite some time. Andrew Downing  chronicled the history of pears from the early Roman era and quoted such notables as Pliny, Theophrastus, and Virgil. Pliny said the varieties were exceedingly numerous, but doesn’t seem, to have appreciated them much, “all pears whatsoever are but a heavy meat, unless they are well boiled or baked.” Downing went on to say the really delicious qualities of pears weren’t developed until about the 17th century. “The greatest value of the pear is as a dessert fruit. Next to this, it is highly esteemed for baking, stewing, preserving, and marmalades. In France and Belgium the fruit is very generally dried in ovens, or much in the same way as we do the apple, when it is quite an important article of food. Dessert pears should have a melting, soft texture, and a sugary, aromatic juice. Kitchen pears, for baking or stewing, should be large, with firm and crisp flesh, moderately juicy. The juice of the pear, fermented, is called Perry. This is made precisely in the same way as cider, and it is richer and more esteemed by many persons. For complete instructions on grafting, growing, marketing, etc. 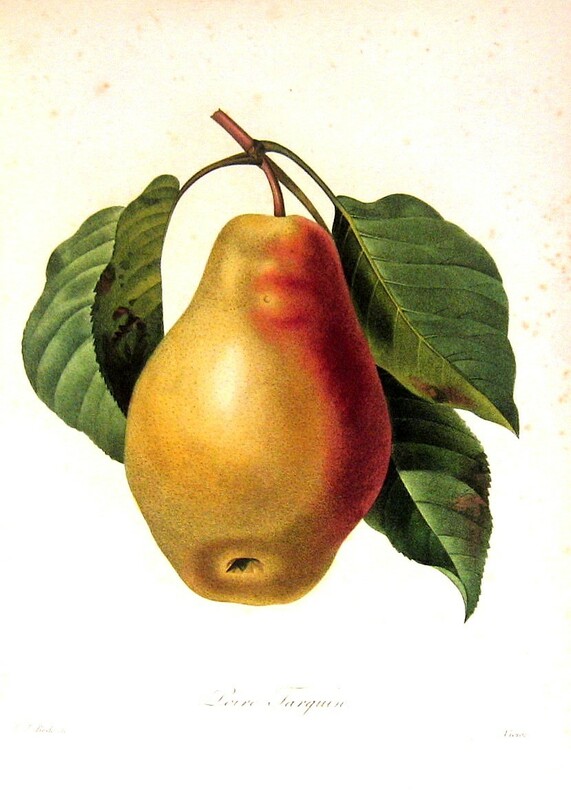 and illustrations and descriptions of pre-1860 varieties of pears, see: Field, Thomas Warren. “Pear Culture”. 1858. NY. Now, gentle reader, would you like to accompany me as I skim through some vintage methods of preserving and using these gifts from Nature? Eight lbs. of seckle, or other nice pears, 8 lbs. of granulated sugar, ½ lb. candied ginger root, 4 lemons. Chip or slice the pears very fine, slice the ginger root and let these boil together with the sugar for 1 hour, slowly. Boil the lemons whole in clear water until tender, then cut up in small bits, removing the seeds. Add to the pear and boil 1 hour longer and pour that into tumblers…[Put up in jars. Recipes for gingered pears are found universally in cookbooks from this era]. BAKED PEARS. Fannie Farmer. Wipe, quarter, and core pears. Put in a deep pudding-dish, sprinkle with sugar or add a small quantity of molasses, then add water to prevent pears from burning. Cover and cook two or three hours in a very slow oven. Small pears may be baked whole. Seckel pears are delicious when baked. FRUIT FRITTERS. Fannie Farmer. Fresh peaches, apricots, or pears may be cut in pieces, dipped in batter, and fried same as other fritters. Canned fruits may be used after draining from their syrup. PICKLED PEARS. 1922. Country Kitchen Cookbook. ½ pk. Small pears; 1 pt. vinegar; 2 lbs. brown sugar; 1 oz. stick cinnamon; ½ tbsp. whole cloves. Boil sugar, vinegar and spices together for 15-20 minutes. Peel the pears but do not remove the stems. Put into the syrup and cook slowly until soft. Seal in glass jars. PINEAPPLE AND PEAR PRESERVES. The Settlement Cookbook. 1920. 1 lb. pears; 1 can sliced pineapple; 1 ½ cups sugar; ¾ cup boiling water. Dissolve sugar in water, let heat to boiling point. Cut pears in halves lengthwise, remove cores and skin and add to hot syrup. Let cook until pears are tender. Cut pineapple in quarters, add to syrup also, and let cook until fruit is clear. Put in sterilized jars and seal. PEAR CONSERVE. The Settlement Cookbook. PEAR BUTTER. Superior Cook Book. 1905. Pare and cook pears, put through a colander, and to 5 cups pulp add 4 cups sugar, and cook until thickness of apple butter. PEAR PUFFS. Peel good pears, cut out the blossom end, but leave the stem; simmer the pears until tender in a weak syrup flavored with lemon, then drain, and allow them to cool. Make a good rich pie crust, roll out thin, cut into triangular pieces and cover each pear pinching the crust neatly together, but leaving the stem protruding. Bake in a quick oven to a pale brown, and serve hot or cold. BAKED PEARS. 1897. Mrs. Owens. Pare and remove the cores, fill with brown sugar and put into a pan with a little water (a cup to 6 or 8 pears) and bake until tender. If ripe it will take but a few minutes. Serve with cream. PEAR MARMALADE. “The Kentucky Housewife”. 1839. PEAR BUTTER. “The Kentucky Housewife”. Take sweet cider just from the press, and boil it in a preserving kettle till reduced to one third its original quantity. Have ready some fine ripe pears, that have been pared, cored and sliced; put them in the cider, and boil them gently till they are quite soft. Mash them to a pulp, season it with nutmeg, cloves, mace and lemon; set it over a few coals, and simmer it slowly till it is nearly thick enough to slice, stirring it almost constant towards the last, to prevent it burning at the bottom and sides of the kettle. Put it in queensware jars, and if boiled sufficiently, it will keep good a year or two, and will be found fine for the tea or breakfast table. [Seal appropriately.] Lettice Bryan wrote that dried pears made a good sauce when stewed, or they could be made into pear butter instead of fresh pears. Cover pear slices with sugar and let stand overnight. Enough liquid will be produced to allow cooking without adding water. Stir to mix pears, sugar, and juice. Add lemon slices. Bring to simmer and cook over low heat, stirring frequently, until pears are tender, clear, and caramel colored and liquid is consistency of honey. This will take 1 1/2 to 2 hours. Pour preserves into sterilized jars, leaving 1/2 inch headroom and seal with sterilized lids. Cook pears and sugar until sugar melts; simmer 45 minutes. Add pineapple; cook 5 minutes longer. Spoon into hot jars. Process in hot water bath 10 minutes. Yield: 6 half pints. Mix all ingredients and bring mixture to a full rolling boil. Reduce heat and simmer until the pears are tender and mixture thickens, approximately 30 minutes. If the mixture does not thicken you can add about one tablespoon pectin. Place in sterilized jars and seal while still hot. Heat ¼ cup sugar with the pecans and stir until the sugar melts and the pecans are caramelized. A home-made vinaigrette can be made with 1/3 cup good olive oil, 3 Tbsp-. red wine vinegar, 1 ½ teaspoons sugar; 1 ½ teaspoons prepared mustard, 1 clove garlic, chopped; ½ teaspoon salt and fresh black pepper. Blend together. On the way to the new place last night Martin’s keen eye discerned a beaver by the side of the road and we went back for a closer look. He did not seem at all afraid of people as we were able to stand maybe 5 feet away while he grazed away on red clover. I had never been that close to one in the wild or had an opportunity to watch it eat, and it was quite pleasurable to see it reach for bunches of clover with its front paws, bite it off, and reach for another handful, all very raccoon-like. When he’d finished his dinner, he walked around and down an embankment to a little creek where he no doubt has a home. We wondered if recent heavy rain flushed him out of that home, but decided by the size of the patch of clover that had been bitten off he’d been coming there since before the creek flooded, or else he has loads of hungry friends. (I will post a photo later). After 15 minutes of watching our new friend eat his dinner we drove on and after a moment I thought of my new fruit trees and how quickly the bunnies or deer could dispatch them. I think I will put better wire around them and discourage nibblers. I am looking forward to my first harvest, but in the meantime let’s take a look at how our grandmothers would have served those apples. BAKED APPLES. Pare some large greening or pippin apples and remove the cores without breaking the fruit; set the apples in a shallow tin pan, fill them with sugar and pour a little water in bottom of pan; set them in a hot oven to bake till done; care should be taken not to have them broken; when done remove them from oven, pile up high in a glass dish and dust with fine sugar. APPLE SAUCE. Pare, core and cut into small pieces 12 good sized tart apples, put them into a saucepan with ½ pint water [cider or juice is better] and cover and stew till tender; add 1 cup sugar, press it through a sieve or colander, pour into a glass dish and serve either warm or cold. COMPOTE OF APPLES. Choose medium sized tart apples, pare and cut them into halves, take out the cores, round the edges and lay them in cold water with lemon juice; boil 1 pound sugar with 1 pint water and the rind and juice of 1 lemon in a wide, low saucepan; put in the apples and let them boil 3 minutes; then turn the apples around, cover the pan and set it on side of stove, where they will stop boiling; let them stand 10 minutes; then thrust a straw through them; if it goes through easily they are done; if not, boil them for a minute longer; remove them from fire and set aside; when cold take the apples out of the syrup and lay them on a sieve; boil the syrup down until it thickens; pile the apples up in a glass dish and pour the syrup over when cold. APPLE SOUFLE. Strain 1 quart apple sauce through a sieve, sweeten to taste and add the juice and grated rind of 1 lemon, the yolks of 5 eggs and lastly the whites of the eggs, beaten to a stiff froth; put this into a buttered pudding dish and bake till it cracks on top; sprinkle with sugar and serve without sauce. PLAIN DUMPLINGS WITH STEWED APPLES. Pare, core, and cut into quarters 6 tart apples; boil 1 cup sugar with 2 cups water to a syrup, put in the apples and boil till tender, but do not allow them to break; when done take the apples out with a skimmer and lay them on a dish; mix 1 cup prepared flour with 1 egg, 1 teaspoonful butter and a little water into a thick batter, drop a small portion of the mixture with a teaspoon into the boiling apple syrup and boil 5 minutes; remove them, lay in a circle around the apples and pour the syrup over them. A few slices of lemon may be boiled with the syrup. This dish can also be made of pears, dried apples or apricots. Press 1 pint stewed apples through a sieve, sweeten to taste and add the juice of ½ lemon, a little grated nutmeg and the yolks of 4 eggs; line a pie plate with crust, cover with buttered paper, fill the plate with dried peas and bake till crust is a light brown; remove paper and peas, fill in the mixture, return pie to oven and bake till done; in the meantime beat the 4 whites to a stiff froth and add 1 tablespoon powdered sugar and a little essence of lemon; when pie is done draw it to front of oven, spread over the meringue and let it remain for a few minutes longer in oven; then take it out and serve when cold. APPLE PUDDING (German art). Pare, core and cut into quarters 6 good sized tart apples, put them into a stewpan with a little water and boil till half done; then carefully remove the apples to a pudding dish, pour 3 tablespoonfuls raspberry syrup or jelly over them and set aside to cool; place a saucepan over the fire with 1 pint milk and ½ tablespoonful butter; as soon as it boils put in 1 cup sifted flour and stir until the mixture forms into a smooth paste and loosens itself from the bottom of saucepan; transfer it to a dish; stir 1 tablespoonful butter to a cream and add alternately the yolks of 5 eggs, 5 tablespoonfuls sugar and the paste, a spoonful at a time; when this is well blended together add the grated rind of 1 lemon, ½ cup finely chopped almonds and lastly the beaten whites of 5 eggs; pour this mixture over the apples and bake in a medium hot oven for ¾ hour; it may be served with wine, fruit or hard sauce or may be dusted with sugar and served without a sauce. NOTE. When peaches, cherries, plums or berries are used they need not be cooked before baking. It is not uncommon for someone to say they purchased a home because they loved the site though the house needed updating, and Martin and I have joined that elite club. We purchased a small farmstead in a picturesque and peaceful farming community, far from the hustle and bustle, and are tweaking a few things so that it better suits our eclectic style (think “Antiques Road Show” meets “Obscura”)*. The home is structurally sound, but we are updating counter tops, floors, and bringing some color into an otherwise all-white interior. I have spackled all the tiny holes where pictures were hung and now we are starting to replace the counter tops and backsplash which are actually in great condition but not a color we would have chosen. Next, we will transform a white master bedroom by painting it a sunny light yellow/gold and dressing it with gold and burgundy toile curtains and a paisley quilt and shams in the same colors. The dining room will be given a coat of sage green with curtains of rust with gold and green embroidery. The kitchen is vintage pine which we love and which will remain. One set of lower cabinets is going to move forward into the kitchen by three feet becoming an island with butcher block top while those top cabinets and two matching base cabinets from the dining room will be moved to the laundry room. The kitchen, dining room, and hallway will soon be clothed in porcelain tile replacing the white floors. (I did say it was all white). There is a huge bonus room on the back, overlooking the pasture, which eventually is going to morph into a typical mid-18th century room complete with a Rumford fireplace for cooking. There is a fireplace in the home now, but apparently poorly designed. The first owner could not get it to draw correctly, so he enclosed it by adding a large pantry built around it. Poor Martin was so disappointed to see that! We considered removing the cabinetry and trying to tweak it, but in the end decided to leave the pantry and put an awesome Rumford fireplace in the bonus room. It is not a large remodel if you happen to be a contractor, but for us, it is taking a lot of patience figuring out our options and deciding the best way to implement them because we are anxious to get moved and sit on the porch and enjoy the beautiful sunsets and search the stars for constellations. Anxious or not, though, we are firm in our resolve to finish the changes before moving in rather than move in and have to work around everything. We are cutting saplings, bushes, and trees we don’t want and adding more flowering plants such as azalea, camellia, and gardenia. The view out the front is as tranquil as overlooking the pasture in back so while we aren’t parting with fruit trees or any of the existing ornamentals, we are thinning out the less desirables which have come up from the roots of a nearby tree or from seeds buried by the squirrels. The project won’t be finished until we’ve hung a swing from one of the giant oak limbs for the grandkids and provided homes for chickens, ducks, geese, and other barnyard critters for them to visit. I’m currently trying to decide between sheep or goats and the sheep are probably going to be the clear winner. I’m also anxious to have larger vegetable and herb gardens, but first things first. We are thankful to have a place we are so enthusiastic about – we’re full of ideas, but have to remember we have both budget and time constraints to work within and commit projects to paper by order of importance. That’s OK though. We are deliriously happy, enjoying working together while seeing the house and grounds take shape and begin to reflect our unique personalities. Who would have thought two people could have so much fun planting trees? Blissful Meals yall. •	“Obscura Antiques and Oddities” is a shop in NYC that carries a rather bizarre line of merchandise.